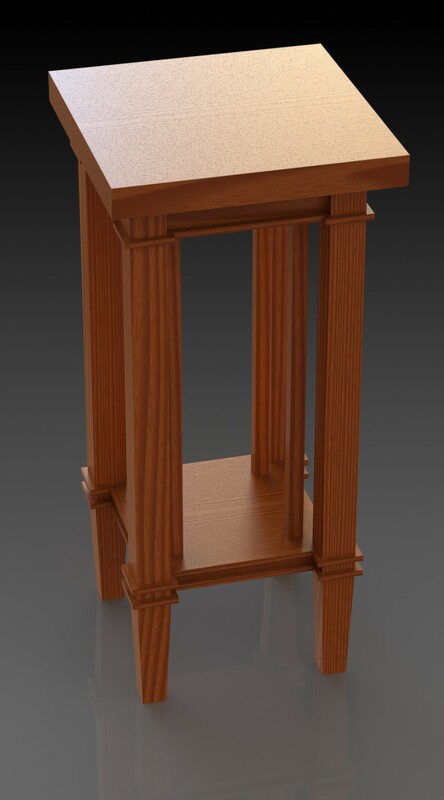 Thanks for the feedback on the Frank Lloyd Wright plant stand I posted yesterday. I made some tweaks to the design to try to closer to the reproduction photograph, and I think I’m as close as I’m going to push it.I think the design is reasonably well balanced, taken on it’s own. If I build it or read more about FLW’s aesthetics my view could change on that. So what’s different from yesterday’s version? Glad you asked! I made the legs thicker, going tom 1 9/16″ to 1 3/4″. I also added tapers on all four faces of the legs, where previously is was only on the two inner faces. The inner legs are nudged outward toward the outer legs. And I rendered it in a darker wood color. I’m not happy with the rendering – on some faces the color looks like dark stained Pine rather than Oak. 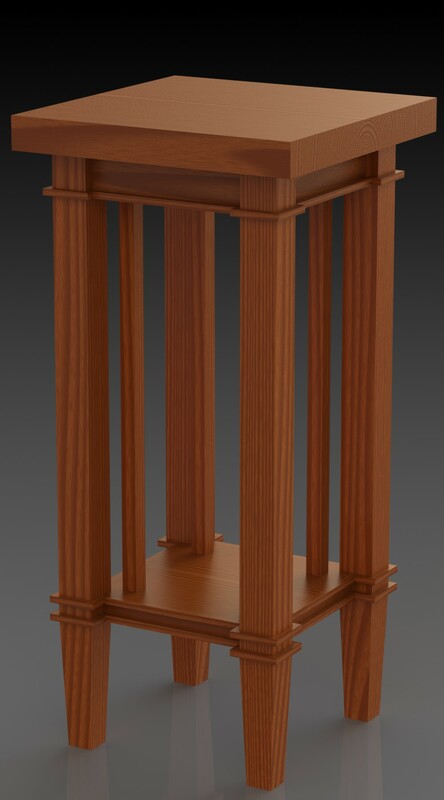 That’s a weak spot in the CAD software, it takes a crazy amount of fussing around to get calms wood projects to render in a photorealistic way — but if you can ignore the weird grain and look at the proportions I think it’s OK. The tim might be something to reduce in scale, but I’ve left that as an exercise for whoever wants to build this project. If you do build it, send me a pic so I can foster a sense of justifiable jealousy. Read on to get the plans to download. I spent a couple of hours preparing the plans once I had the CAD model done. Sometimes I find errors in the model who I’m building the plans – and that’s a good thing. Sometimes I find a way to improve the design. All of which to say, drawing up the plans is time well spent for me. My only concern when I post plans is reading stories about unscrupulous people who steal other people’s work and then sell it. So, please do download the plans. Enjoy them. Use them to build this table, or as a tool to coerce a friend to build it (ehm, Rob?). Of use them in the fireplace to start a nice comfy fire on a sold winter night and cuddle up with your family. But please, don’t sell them. The legs could be heavy? and the trim seems too squarish (or narrow?) If someone builds this, It could be tweaked but this looks good! Thanks Craig. I set the leg size based on the reproduction photo in yesterday’s post. All these things can be tweaked, but I think someone needs to build it to see how it looks. The finish on the wood will affect it too. Done it a light wood the legs will be visually thinner. In a dark mission finish they might be too heavy. I like the look of this “heavier” version. It gives the impression of being grounded. Much like a plinth for statuary. I really like the way you did up the plans too. Thanks for these. You’re welcome! I like the heavier version better myself. Gotta get cranking in the shop this weekend, projects to do!